What kind of clothing and equipment should you take into the field? The best clothing and equipment would be similar to those you take hiking or rock-hunting. Of course, the clothing and equipment must be suitable for the local environment. For example, clothing for a dinosaur dig in the Gobi Desert would be much different than for one in Antarctica. And equipment needed for a day dig at a local quarry would be different than the equipment needed for a months-long expedition in a remote part of the world. The following is just a general guide to clothing and equipment. It is by no means complete. If you are inexperienced in hiking or working in the outdoors, seek more specific advice from those who are—such as geologists, backpackers, paleontologists, and mountain-climbers. There are numerous books on preparing yourself for the outdoors, and outdoor stores can be gold mines of advice. Also, many organizations sponsoring dinosaur digs have lists of required clothing and equipment to use as guidelines. Appropriate clothing for weather and conditions: For example, long sleeve shirts, T-shirts, shorts, long pants, sweaters, jackets, underwear. Control your temperature through the shedding or adding of multiple layers of clothing. Take enough for the length of the expedition. Backpack: Used to carry tools, food, water, and extra items. Sturdy boots: For hiking to the dig site; and protection from falling rocks and hard surfaces. Gloves: For hand protection during digs. Also to keep hands warm in colder climates. Safety helmet: Protection from falling rocks if working in an area with cliffs, or collecting in a working quarry. Rain gear: Protection from getting wet; can also be used to stay warm. Flashlight: For illumination at night or for under dark overhangs. Hat: Protection from sun or rain. Use when there is no danger from falling rocks. Sunglasses/sunblock: Protection from the Sun’s ultraviolet rays. Goggles: Eye protection from flying rock chips. Canteens: For carrying water in remote areas. Camera and video recorder: Record excavation of fossils. Compass and map: For finding directions in remote locations. First-aid kit: In case of injury or other medical emergencies. Tent, sleeping bag, cooking gear: For shelter, rest, and cooking food at remote site. 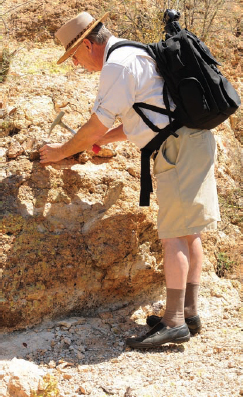 It is very important to dress appropriately and to take all the necessary gear with you when you are fossil hunting, especially when you are in a remote area (Big Stock Photo).